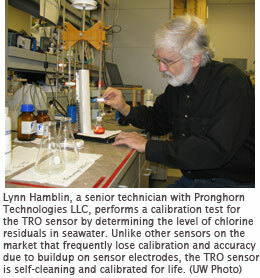 (From left) Weston Welch, CEO of Pronghorn Technologies LLC, observes Dr. Kent Henry, Pronghorn's chief technology officer, perform a quality control test on a total residual oxidant (TRO) Marine Sensor. The device, which is specifically developed for the automation of water disinfection systems in high salinity environments, has drawn the interest of the United States Navy, as well as various businesses. When Weston Welch first visited the Wyoming Technology Business Center, he was on a building tour with University of Wyoming college classmates. Today, with the help of the center's expertise and resources, Welch's start-up company occupies a laboratory in the facility and currently is demonstrating its technology to various factions of the United States military. Pronghorn Technologies LLC, the company of which Welch is CEO, is one of the WTBC's success stories. Since 2008, the start-up has secured more than $1.5 million in research and development grants to hone its total residual oxidant (TRO) Marine Sensor, which is specifically developed for the automation of water disinfection systems in high salinity environments. The device has drawn the interest of the U.S. Navy, an offshore gas exploration company, ballast water treatment companies and a business that builds commercial-grade saltwater swimming pools, Welch says. "It's really been beneficial to have a lab set up. It's (WTBC) a professional environment to come to, versus working out of a garage," Welch says with a chuckle. "It motivates me and reminds me we are a professional organization." The WTBC is a statewide UW business development program that is developing a technology business incubator and an outreach program focused on early-stage, high-growth companies. The 30,000-square-foot facility, which opened in 2006, offers laboratory, office and shared-conference room space for client companies as well as a state-of-the-art data center. All client companies -- which are required to be based in Wyoming -- located in the incubator have access to one-on-one business counseling and executive coaching services provided by WTBC staff. The program is designed to help client companies grow larger and faster than they would otherwise, and to increase the ability of the entrepreneurs to manage and grow their own business. When Welch looks around his office and laboratory space in the WTBC, he knows such an environment exudes professionalism to potential clients and provides an atmosphere for creative thinking and accomplishment for his four-person staff. "What's great about this place is that it's nice to have someone say ‘hi', ‘good morning' and smile,'" Welch says. "The receptionists here are very helpful and provide a nice professional welcome. We provide parking tags for visitors. We have conference rooms, janitorial services and video teleconferencing capabilities. It's a comfortable facility that provides our company with valuable options." That professional environment has helped Welch emerge from humble beginnings to the cusp of launching a business he has always dreamed about. Welch's first exposure to the WTBC was as a graduate student studying for his MBA at the UW College of Business. Through one of his classes, he took a tour of the facility. Later, he and one of his classmates took second place in the UW College of Business 10K Entrepreneurship Competition. For that competition, Welch invited the CEO of ADA Technologies, Inc., Clifton H. Brown, as well as Dr. Kent Henry, an employee of ADA and inventor of the TRO sensor technology, to observe. The strong showing led to Welch working the following summer with Henry at ADA on the TRO sensor technology, touring Navy ships and laying the groundwork to start a new company. 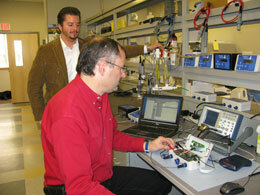 In 2008, Welch created Pronghorn as a spin-off of ADA Technologies, Inc. His goal was to commercialize the oxidant sensor technology for use by industrial and consumer markets. Since 2005, Pronghorn and ADA have received nearly $2.6 million in grant funding for the TRO sensor. "Quite a bit has developed. When I presented the technology (at the 10K competition), it was three small circuit boards," Welch recalls. "Now, we have a very sophisticated design." Pronghorn's TRO sensor is designed for use with advanced shipboard desalination systems used to create potable water and water disinfection systems used to clean cooling lines for propulsion and HVAC systems. Desalination is the process of removing salt and other minerals from saline water. The TRO sensor is capable of continuously detecting and reporting residual oxidant levels in hypochlorite-enhanced seawater streams used to kill marine organisms. Hypochlorite is an oxidant in household bleach that makes it an effective disinfectant. Jonathan Benson, WTBC chief executive officer, describes business as "solving someone else's problems." Welch recognized the Navy had a problem. "I told them we can create a TRO sensor that will automate their water disinfection systems to reduce manpower requirements, energy consumption and chemical emissions," Welch says. "The sensor will provide accuracy and reliability without the maintenance found in other comparable sensors." According to Welch, other similar sensors are fragile, need to be cleaned often and are often knocked out of calibration due to the dirt build-up from the saltwater. Welch says Pronghorn's sensor will assist the Navy by automating critical water disinfection systems; prolonging the life of expensive equipment; and simultaneously protecting marine ecosystems from excessive chlorine discharge. "Our sensors are self-cleaning, self-maintaining, insensitive to flow rate and pressure, and are calibrated for life," Welch says. Welch said development of his TRO sensor is in the final stages and, soon, he will be conducting sea trials for the U.S. Navy, Office of the Secretary of Defense, Naval Sea Systems Command (NAVSEA) and the Department of Defense. While things are looking up, Welch admits there have been periods of crisis during his journey. And he credits the WTBC with being there and providing reassurance. "We've gone through stages where there's not a lot of money and times are tough," he says, recalling a dry period of approximately four months without funding as the toughest stretch. "The best thing is to have someone to listen to you and provide encouragement; someone with prior business experiences so you can relate. You think, ‘He's survived. So can I.'" The WTBC work environment and the grants have enabled Pronghorn to hire and retain the talent to conduct research and do the work. Welch ultimately envisions Pronghorn as a manufacturing and distribution company that will eventually employ 28 people and build to $40 million in sales within five years. "Our goal is to be a Wyoming company, grow our company, provide jobs for citizens and bring revenue back to Wyoming," Welch says. "Within a year after we launch our product and have consistent revenues and sales, then we will look at moving our operations to a commercial property in town."